In this VETgirl online veterinary CE blog, we demonstrate how to treat the constipated cat. These patients often present slightly dehydrated, very obese, and with underlying disease - in other words, a disease process that predisposes them to a dehydrated state (e.g., renal failure, diabetes mellitus, etc.) or due to primary gastrointestinal (e.g., colonic) disease. Treatment typically includes fluid therapy (e.g., intravenous, subcutaneous), pro kinetics, and enemas. With severe constipation, manual de-obstipation may be required under sedation. 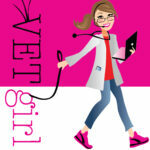 Personally, VETgirl isn't a huge fan of manual de-obstipation - instead, we aggressive hydrate and enema-ize. In this VETgirl video, we show our secret enema concoction: warm water, lots of lubrication, and lactulose. We typically administer 120-180 mls of this solution rectally every 4-6 hours while simultaneously hydrating the patient. Keep in mind that the gastro-colonic reflex can be stimulated from the enema - in other words, the patient may vomit from the enema. More importantly, educate your pet owners on why they shouldn't be using Fleet enemas! That said, with aggressive supportive care, these patients can do well! What's your enema concoction that you use with success? Comment below! Have a bobtailed cat that has very bad constipation problems. Gone numerous times to vet to be manually cleaned out at 300.00 a visit. Any suggestions, lactulose hasn’t worked well. Hi Brenda, we don’t actually answer pet owner queries here! Please contact your veterinarian. There are definitely other oral medications you can consider. You can also consider making an appointment with an internal medicine specialist too if needed. Thanks! My cat, Al, has mega colon. He’s had constant issues with constipation and has been to the vet numerous times that have cost me a small fortune. He is on lactulose for stool softening and also cisipride tablets to get his colon moving. Was very frustrated and went online and found a recommendation to add Miralax (the people stool softening medicine) 1/4 tsp. to his wet food every morning. It has been a life saver! He was doing well for about a year and I think it was my fault he had another issue so my vet recommended 1/4 tsp morning and night and now he is back to having no issues. My vet is aware that I dose him with Miralax and has no negative comments about it but double check with your vet before you add it to your cats food. I did and it has really helped him. Hope this helps you and your feline!